When my friend Melanie called wedding planning “traumatic” earlier this fall, I thought she was joking. I must have just been overreacting to the overwhelming pressures of decision-making, I thought, after I had complained about wanting this part of the whole deal to be over. No, she was, indeed, quite serious. And she was right. Don’t get me wrong — our wedding day, the most gorgeous day of October in the New York-metro area, replete with frost on the grass in the morning and abundant, warming sunshine throughout the afternoon and so very much love from so many of our closest and favorite people, was better than I ever could have dreamed. On that day, all the meticulous planning, all the decisions, all the trust that ultimately went into our amazing vendors and our incredible family and bridal party to keep us calm and ensure that everything went smoothly, were worth it. But of course, in the weeks leading up to it, I had given myself an onerous task that I should have known better than to leave ‘til the last minute. There was, of course, no way I was going to bake desserts for my own wedding, but I still wanted to share the love with our friends and family in the form of food made from my own kitchen. I would make our wedding favors. 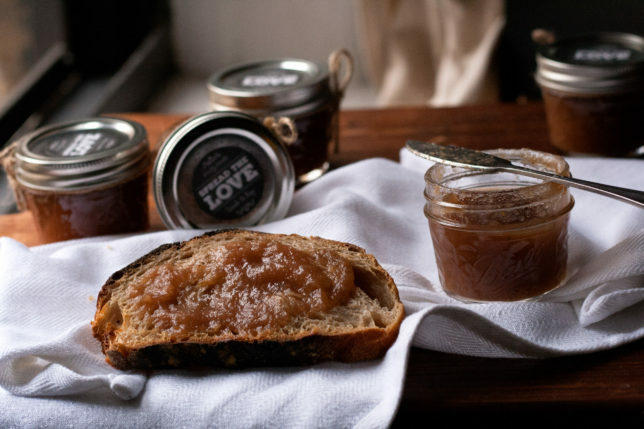 I would learn to make — and preserve — apple butter. My mom thought I was crazy when I told her my plan back in the spring. “Don’t worry!” I said. “They’ll be shelf-stable so I can do it in the summer, a little at a time.” Did I do this in the summer? Of course not. I put off the decision on whether to make apple butter or pumpkin butter, a serious contender, until sometime in September. But how was I going to haul dozens of pounds apples back from the farmer’s market without breaking my back?? I procrastinated figuring that out, as I do, as the days ticked by. Finally, I decided my best opportunity was to do it when we had a car and drove out to New Jersey to apply for our marriage license — 10 days before the wedding. It was a gorgeous Tuesday out in the rolling hills of northwestern New Jersey. So gorgeous that we took our sweet time meandering through the orchard, picking 36 pounds of Cortlands, Liberties, Jonagolds, Macouns, and the best damn variety I’ve ever tasted in my entire life, heirloom King Davids. We hauled our crop back in the little ‘89 Camry we had borrowed from a friend later that night, and I dropped the bags on the floor and promised myself I would start the next day. No, of course I didn’t. It wasn’t until Thursday morning that I had my recipe nailed down, the bags of sugar and multitude of lemons procured, that I finally thoroughly read through instructions for canning safely and realized I needed a pot big enough to hold as many 4-ounce jars as I could. Drat! Sur la Table on the Upper East Side to the rescue, I finally made my first batch that night. I would make five more separate batches over the next two days, quartering, cooking, pureeing, cooking some more, sterilizing, jarring, cleaning, canning. But let me tell you something: these, too, were worth it. Sweet, tangy, spicy and perfect spread on toast or biscuits, dolloped over a Dutch baby, swirled into oatmeal, or sandwiched next to cheddar in a grilled cheese, apple butter is, contrary to the anecdote above, incredibly easy to make. The apples are roughly quartered without seeding or peeling (maintaining the bulk of the pectin), cooked down for 20 minutes, sent through a food mill, then cooked down with sugar and lemon and spices until it’s gooey and gloppy and makes your home smell like a cider mill. 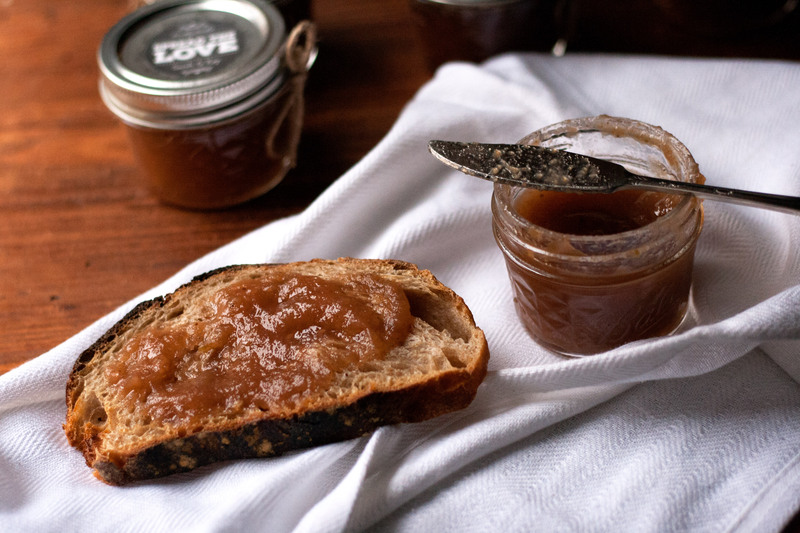 Canning, too, is easy, if you want your apple butter to last longer than a couple of months. And in your case, most likely, you won’t be portioning them into many tiny jam jars like I did, so the whole process could be done in a snap. The problem is, see, I kind of scarred myself doing it. Not in the literal sense, just in the, holy hell, I need a break from baking anything new for a while sense. Hence the ridiculous and appalling lag in posts here. I’m kind of ashamed that I missed almost all of fall. Truly, I didn’t start baking again in earnest until after the election, when the need for a return to normalcy was too great to ignore. In the kitchen, at least, I am in control, and any mistakes there are much easier to swallow. So here I am. Here we are. Our lives could all be better sharing a little apple butter, don’t you think? Let’s spread the love. You’re probably looking down this recipe wondering why the range of sugar, why the range of total product? The amount of sugar you’ll add depends on how much apple puree you have. While the original recipe calls for ½ cup of sugar for every cup of apple puree, I found that ⅓ cup was more to my liking after the first batch. If you’re unsure, start with the lower end of sugar and adjust it after you’ve added your spices — you can add sugar, but sadly, of course, you can’t take it away. I found it easier to measure out a cup of the puree at a time, then dump in my relative amount of sugar after each cup, on and on until I was at the end of my bowl of puree. Cut apples into quarters without peeling or coring them, but cut out any damaged parts. Place them into a large pot and add vinegar and water. Cover the pot and bring to a boil. Reduce heat to a simmer, and cook until the apples are soft, about 20 minutes. Remove from heat. Ladle the apples and their liquid into a food mill and press it into a large bowl below. Measure the puree into a large, heavy-bottomed pot, and add ⅓ to ½ cup sugar for each cup of apple pulp, stirring to dissolve. Add a dash of salt and the cinnamon, cloves, allspice, lemon zest and juice. Taste and adjust seasonings if necessary. Cook uncovered over medium low heat, stirring fairly constantly to prevent burning. Occasionally scrape the bottom of the pot with a wooden spoon or or silicone spatula to ensure a crust doesn’t form . Cook until the apple butter is thick and smooth, about 1 to 2 hours. You’ll know it’s ready when a small dollop dropped onto a chilled plate gels up, rather than runs down the plate. Prepare boiling water bath canner by filling half-full with water and keep at a simmer, covered, until ready to jar. Rinse out jars, dry them, and place them without lids in a 200-degree oven for 10 minutes. This will sterilize them. Sterilize your lids by placing them in a bowl and pouring boiling water over them. 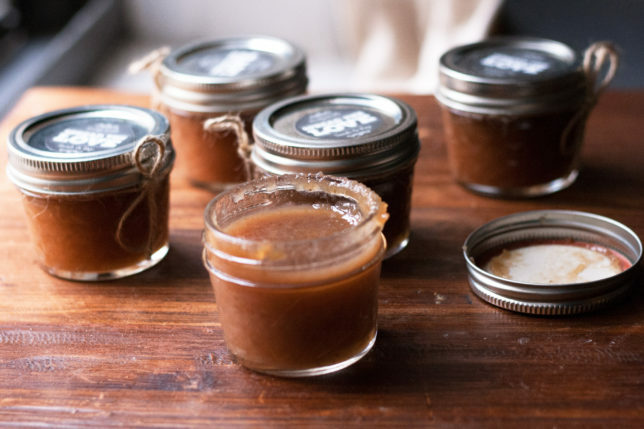 Pour the apple butter into the hot, sterilized jars, leaving about ¼ inch of headspace, and clean the rims. Place sterilized lid on top and twist the ring until finger tight. Place jars on canning rack and lower into the canning bath, making sure that the jars are covered by 1 to 2 inches of water. Place the lid on the canner and bring water to a full, rolling boil. Set timer for 10 minutes. Turn off the heat and remove the canner lid. Allow jars to stand for 5 minutes before removing. Carefully remove and set upright on a towel to prevent jar breakage. Let jars sit undisturbed for 12- 24 hours. 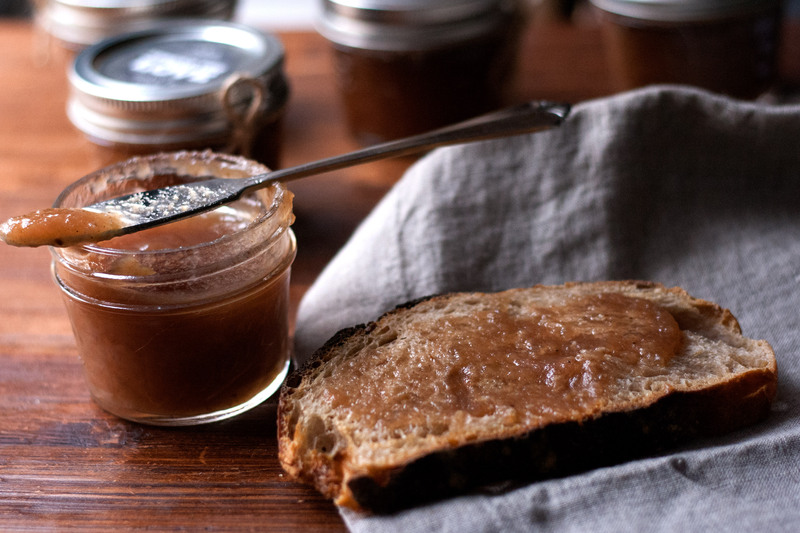 Just made some apple butter for inn breakfasts – thanks so much for the recipe Sarah! Also thank you (and Melanie) for saying that wedding planning is traumatic. Because it is.